Jacob van Walscapelle’s main still-life subjects were flowers and fruit. Until c.1670, flower paintings in the style of Cornelis Kick (1631/34-1681) dominate his oeuvre, but subsequently he seems to have been inspired to some degree by still lifes that were being produced in Utrecht by Jan Davidsz. de Heem (1606-1682/84) and Abraham Mignon (1640-1679). His meticulously rendered, strongly lit and sharply defined fruit and flowers, in any case, are reminiscent of the works that de Heem and particularly Mignon painted during the second half of the 1660s. Among van Walscapelle’s most impressive pieces is a pair of garlands of fruit and flowers that he dated in 1672 and 1674, now in the collection of the Municipal Museum in Arnhem. [ii] These paintings include many of the motifs that he repeated in his still lifes from the 1670s [2-3]. The still life under discussion here fits well within the group of floral still lifes by Jacob van Walscapelle that date from about the mid-1670s until the mid 1680s. A larger example in the Städelsches Kunstinstitut in Frankfurt am Main that is dated 1677, although a more elaborate composition, is closely related to the present painting in style and handling . Several of the flowers, such as the pink rose, the poppy anemone, and the iris are similar in both paintings. Slightly larger than the present painting and probably somewhat earlier is an undated example in the Musées Royaux des Beaux-Arts in Brussels . [iii] The calligraphy of the signature of that flower piece is almost identical to that of the painting discussed here. Probably somewhat later is a much larger floral bouquet by Walscapelle, dated 1681, that was sold at Christie’s Amsterdam in 1985 . [iv] A date of origin in the mid to late 1670s would appear to be the most plausible for this little painting. 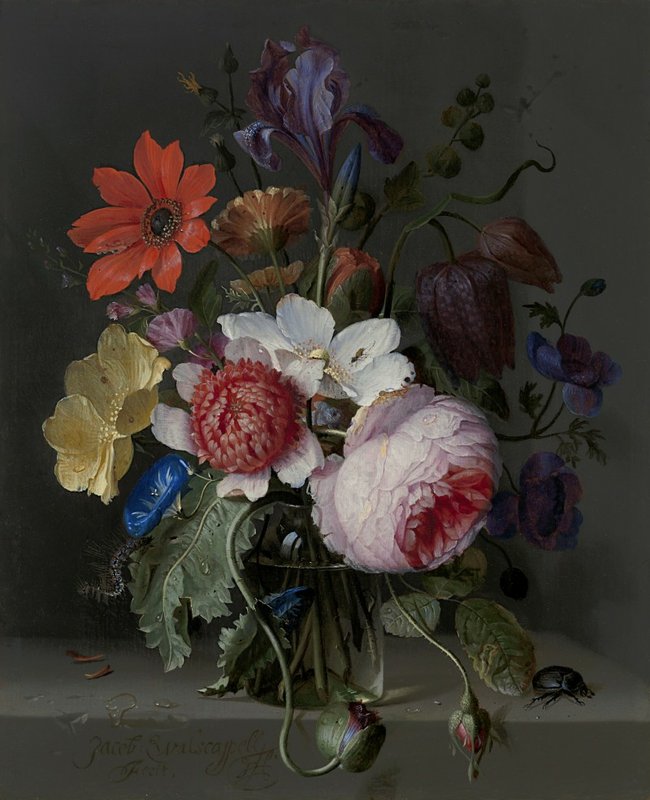 This modest bouquet with its relatively simple composition is a highlight in Jacob van Walscapelle’s oeuvre. The artist has concentrated on the quality of the flowers and the three-dimensionality of the bouquet. While the painting breathes an ultimate stillness, it also possesses a liveliness owing to the elegant curves of the poppy and rose stems at the front and of the curled leaf of the fritillary at upper right. In keeping with the modesty of the bouquet, van Walscapelle has also opted for a rather simple container for his flowers. Instead of a decorated metal or earthenware vase, or an ostentatiously reflecting globular glass vase, he chose a simple glass jar, of the type used by apothecaries, as well as for solvents used in a painters’ studio. As small as it is, the bouquet includes a rather large variety of flowers and a combination of spring and summer blooms. As such, this bouquet could never exist in reality; the painter undoubtedly composed it with the aid of studies of individual flowers. The variety suggests luxury; some of these flowers are costly cultivars. So while this little painting, like most of Walscapelle’s still lifes, does not appear to carry any profound symbolism, the blemishes on the stone ledge suggest that with the passing of time all things must wither. This is certainly the case for the short-lived floral blooms and the dung beetle most probably also serves as a symbol of decay. Any such ‘vanitas’ connotation is no doubt secondary, however, to van Walscapelle’s fully successful attempt to present an arrangement of flowers with an enormous degree of verisimilitude. This still life is indeed a very good example of the artist’s mastery of light and textures and of his ability meticulously to render such motifs as stone, glass, leaves and the variety of different flower petals. NB. Photocopies of the pictures mentioned in this report (numbered [x]) are included. Fred G Meijer, Senior Curator of Old Dutch and Flemish Painting, Rijksbureau voor Kunsthistorische Documentatie, The Hague. [i] Still life of flowers and fruit, oil on canvas, 65 x 78 cm, signed and dated 1699, sale Sotheby’s, London, 10 July 2003, lot 27 with colour illus. [iii]Oil on panel, 38 x 30 cm, signed, Brussels, Musées royaux des Beaux-Arts, inv. No. 6130. [iv]Oil on canvas, 102.5 x 89 cm, signed, sale Amsterdam, Christie’s21 May 1985, lot 181, colour illus.